I found myself uncharacteristically bored out of my gourd a few days ago. After watching an episode of “Catfish” on MTV, I decided to do a google image search on the pictures I have posted in various places on the internet. I am a very private person, and prefer not to post too many personal pictures, so my search did not take long at all. In fact, probably 90% of pictures I post are right here, on my blog. I also have a few on my other blog, as well. I was shocked by the results I got. I mean, I am no Michelangelo…but, someone has actually been taking (copying without my permission or knowledge) my cheeky little one dimensional drawings and posting them on their own website. It is some “free art to use” site ran by someone who has the username “vicious animals band”. I don’t think I am as offended as I probably should be. It’s a little flattering that someone actually liked my artwork enough to steal it. I was rather put off by the caption they chose for my drawing of the Ahool. They put: “Boy gets scratched by bat and dies”. Granted, I am fully aware that I am not very chestally endowed, but being compared to a young lad is not quite flattering. I felt I should write this blog to make people aware of the fact that others may be using your pictures. If you have the time, I definitely recommend doing a google image search on your pictures. The results might just surprise you. I know it shocked me. For several months now, I have been plagued by mysterious scratching noises coming from underneath my bed. A few days ago, my security cameras picked on some odd little critter running at the speed of light from under my bed to the wall that is next to the attic entrance. It looks rather like a squirrel or perhaps a chipmunk to me because it appears to have a long, fluffy tail. I don’t believe it is a skunk, because I have not noticed any foul odors, aside from that of my running shoes. lol. I am extremely relieved that it is not a demon, although I guess demons are not capable of giving me rabies. I would love to know if any of you might have an idea what this creature is. I have set up a live trap, but peanut butter seems to be an ineffective bait so far. Any tips, hints, and/or suggestions would be greatly appreciated. The pest control people are rather pricey. I would rather catch and release him myself. Thanks for reading. 🙂 Be sure to watch your toes when you get up in the morning. One never knows what might be lurking under the bed. One simply never knows. I’ve always found the idea of scientists “monkeying around” with animal hybridization experiments rather vulgar and unnatural. Mother Nature knows beyond a shadow of a doubt what she is doing. In my opinion, she needs no help or interference from humans. One cryptid I am absolutely NOT a fan of is the fabled “Humanzee”, for just this reason. Humanzees are reportedly a human chimpanzee hybrid that are created in science labs through artificial insemination or various other more diabolical methods. There is very well documented evidence that in the 1920’s a scientist named Ilya Ivanovich Ivanov actually conducted such experiments. Fortunately, his attempts to create such a grotesque race of creatures failed miserably. Or, so I have read, at least. Don’t get me wrong. I love chimpanzees. I used to always want a pet monkey as a child, but quickly abandoned that idea as I started studying them in depth and learned that most primates are naturally aggressive and highly unpredictable, especially upon reaching sexual maturity. In fact, according to the HSUS, since 1990, there have been over 230 primate attacks on humans here in the USA alone. Chimpanzees are extremely strong, unbelievably strong actually. Even small primates can inflict massive bite wounds, even in some cases ripping off fingers, toes, ears, and noses. Primates also carry many diseases that can be fatal to humans, such as Herpes B, HIV, and Rabies. Sure, these creatures look cute and cuddly, but it is far better to let them live in their natural environments than to risk death by keeping them as pets. Regular readers of my blog know that I am not a huge fan of the exotic pet industry. That just goes without saying. But, what does this have to do with humanzees? Well, let me share my logic regarding attempts to create human chimpanzee hybrids. Knowing that a full grown adult chimpanzee poses a major threat to any human it may encounter, can you imagine what an ape that had the intelligence of a human, especially if it had the knowledge of how to use weapons, would be capable of doing? For example, if a male humanzee has an argument with one of his siblings, what would stop him from breaking out of his cage, escaping the laboratory, and killing any and every living thing he encounters in the outside world? Probably nothing short of a very strong firearm in the hands of a very skilled sniper. It seems to me as though it would be like trying to fight Superman’s Evil Twin, on steroids, times like a bazillion. Humanzees are a very bad idea. Very, very, very BAD. As it turns out, however, there is a creature that already exists that may be very similar to the mythological Humanzees. Say what? Oh yes. Absolutely. Well, not exactly…but, fairly close, anyway. Am I talking about Bigfoot? Nope. But the creatures I am about to tell you about will definitely be a huge hit with fans of Bigfoot, and maybe even fans of the movies “King Kong” and “Planet of the Apes”. In fact, I personally adore these fellows. In 2003, scientists in the Dominican Republic of the Congo discovered a new species of chimpanzee called the Bili Ape, or Bondo Mystery Ape. These primates can grow to a height of 5 and a half to almost 6 feet tall. Considering that most adult chimpanzees grow to an average height of around 4 feet, these chimps are gigantic in comparison. I was so excited when I came across this information. I have mentioned in previous blogs that monkeys are very adept at remaining hidden. Who would have imagined that such massively large creatures could go undetected for such a long period of time? The natives of that region have actually known about Bili Apes all along, although not many of them actually encounter them. These animals are very elusive, and quite possibly exceedingly rare. Many of the local tales about these apes include speculation that they kill lions. Recently, a scientist did observe a Bili Ape snacking on the remains of a dead lion, although he had no idea if the ape was the actual animal that killed the lion or not. I am extremely intrigued by these creatures. Not much is known about them at all. It is very difficult for scientists to study animals in the Congo, due to the civil unrest in that region. I did, however, find a few websites with a little information and a few photographs of these magnificent creatures. If you are interested in learning more about Bili Apes, simply do an internet search for “Lukuru Foundation”, “Jane Goodall Institute”, and “Congolese Wildlife Authority”. These are the most reliable and accurate sources you will find in regards to educational and factual information on Bili Apes. The Lukuru Foundation also has a video of Bili Apes of Youtube. The video is only 40 seconds long, but I find myself continually hitting the “play” button over and over. LOL. I would love to know more about them. If anybody can recommend any other websites, or has any other relevant information, I would really appreciate if you were kind enough to share it with me. I really would like to write a more in-depth article on these fascinating chimps. Thanks for taking the time to read my blog. Keep your eyes, ears, and camera lenses open. You never know just what kind of critters you may encounter. One simply never knows. Oh, and be sure to keep an eye out for escaped pet monkeys. And bear in mind, they CAN and probably WILL bite…and bite HARD. Safety first, my friends. Always. Note to Graham: Nessie and Kraken having tea is a lovely concept, yet I think Nessie might find it rather physically challenging to get the cup up to her mouth, given the length of her neck and the relative shortness of her flippers. LOL. You’ve given me a wonderful idea for a children’s book, though. Thank you. I realize I have not made a post in quite some time. I have been busy with other “research”, actually. I thought perhaps it could be fun for some of my readers to give this a try, so I have decided to share my adventures in my place with all of you. With the harsh Indiana winter in full swing, I am overjoyed to have discovered that I need not even leave my own house to have fun exploring my surroundings. Being the generally nervous type of person that I am, I made the decision to install security cameras in my home. I love it! I have been having so much fun debunking suspected paranormal activity. It did not take me long to figure out that my ghost lights were nothing more than dust particles. I was oddly relieved and disappointed at the same time. So, I grabbed my Swiffer and tackled the dust bunnies that had apparently been breeding uncontrollably for an indeterminate amount of time in my humble abode. The very next day, I reviewed the footage the cameras had recorded overnight. It looked as though several dark shadow figures had been walking back and forth across the length of my closet all night long. Just as I was debating whether or not to pick up the phone and call in the Ghost Adventures Crew, I noticed that these dark figures looked very uniform in nature. So, I switched back to live viewing mode and saw that these pacing specters were marching in front of the camera right in the moment, as well. It was simply a loose connection that needed tightened up in back of the recording box. Bummer! I’ve always had such a huge crush on Mr. Aaron Goodwin, too. A couple of weeks later, I noticed shadows drifting up and down my staircase. I bravely walked upstairs and soon discovered that the shadows were being caused by clouds drifting past the sun. I closed the curtains in the reading room, and the mysterious entities quickly vanished from view. I am quite proud of my ghost hunting debunking skills now. I also sleep much better at night because of the fact that if I hear strange noises I can easily see what is causing them. It is a little tricky at times, due to the fact that sometimes what I think I am seeing is something else entirely. I am also learning a great deal about cameras, as an added bonus. I plan on buying a few more cameras. I have been hearing an occasional scratching and a few loud thuds coming from the attic at night. I really want to put a camera in there to help solve this mystery. My theory is that it is probably either a squirrel or a raccoon. I have to wonder if it could be a colony of creepy insects, too. I did see a very ominous looking stag beetle that was at least three inches long crawl across the bedroom floor a couple of months ago. That is, by far, luckily, the scariest thing the cameras have picked up, as of yet. Home security cameras are so much fun. I definitely recommend that everybody should consider buying some and putting them inside and outside your homes. I’m off to the store now to buy a few more cameras. I definitely want to get some set up outside, too. You see, I have a rather odd situation with a rather large deer. At least I think I do. I hear a loud thud on the back side of the house every now and then late at night. I’m always too frightened to look outside to find the source of the noise right after I hear it. I would probably faint if I looked out the window and saw some huge, hairy beast staring back at me, be it either human or animal or perhaps a mixture of the two. The day after this thud happens, I look outside and every single time I see a very large set of single deer tracks. I am quite perplexed at why the fellow feels the urge to ram into the side of the house. At least, I think it is a deer. I hope so. Perhaps it could be the Jersey Devil. I doubt it. I am not very near to New Jersey. I did also see a television show about feral hogs a few nights ago. I don’t know if we have those in Indiana or not. I’ve never heard any of the locals mention them. One never knows. One simply never knows. 🙂 It sure is fun trying to find the truth, though. As always, thanks for reading. I hope you all have a fantastic Valentine’s Day. I’ve not written a post for quite some time now. Simply have not had either the time or the inspiration to do so, actually. Until… (cue the inevitable “DUN DUN DUN!! !” sounds which frequently occur in most great “B” movies when something profound is about to take place)… I found myself watching “King Ghidorah” (copyright 1964 by Toho Studios) and a few other Godzilla movies while sitting on the couch suffering through the flu. Perhaps it was the combination of having a high fever, listening to “Dead Flowers” by the Rolling Stones, watching monster movies, and being bored beyond belief that triggered the odd train of thoughts which lead me to the creation of this blog. More likely, though, it is merely a by-product of the strange manner in which my brain tends to normally operate, especially while under the influence of massive doses of cough medicine. There is no better way to spend a sick day, nay entire sick WEEK, than to watch Godzilla movies, eat tons of ice cream, and wrap up in a nice warm wool blankie on the sofa, in my opinion. While watching this magnificent movie monster marathon, my mind drifted to memories of other not your run of the mill, ordinary, everyday type of movies I have watched and have quite an affinity for. Perhaps the most unique of those movies is one titled “Little Shop of Horrors”. Wikipedia defines “Little Shop of Horrors” as “an American Rock Musical Horror Comedy”. The original film, which was produced in the 1960’s was a low budget production that was directed by Roger Corman. In 1986, the film was remade with a much, much larger budget, yet oddly still has that wonderful cheesy, low budget effect which I find absolutely endearing. Frank Oz directed the 1986 version, which stars Rick Moranis, Steve Martin, and several other well-known actors. I would hate to give away the storyline for those of you who have not watched the movie and may wish to do so, but I will tell you that the star of the show is a plant. This plant is not your run of the mill, ordinary, everyday houseplant. Audrey the Second is a ginormous, man eating, carnivorous, sort of “Venus Fly Trappy” plant which was created by a rather odd flower shop employee. I started wondering if there could be any factual basis for such a peculiar concept as a man eating plant. So, of course, I consulted with Mr. Google, and was rather disappointed with my findings, at least, to an extent. I discovered that there are carnivorous plants, but most of them only eat insects. Most of them are extremely small, as well. For instance, probably the most well-known carnivorous plant, the Venus Fly Trap, is nowhere near large enough to swallow a human. These tiny little critters also lack the ability to reach out and grab people. They simply sit around waiting for a bug to land on them. Quite often, the insects manage to escape the plant before it is able to fully close up and capture the bug. Once the Venus Fly Trap closes, it can take up to 12 hours for it to open back up again. Not very scary at all. In fact, these little plants should be far more frightened of humans than humans should be of them. The National Wildlife Federation lists the Venus Fly Trap as “vulnerable”, with an estimated less than 33,000 plants left in the wild. In some counties in North Carolina, it is now a felony to take Venus Fly Trap plants from the wild. I remember many moons ago, my parents bought one of these for my little brother when he was around 10 years old. I believe he saw it advertised on a comic book or something. Needless to say, the plant did not do all it was advertised to do, and was far smaller than depicted. My brother quickly grew bored with his new “toy” after he fed it a chunk of hamburger meat and it stayed closed for several days. I believe he thought he could just stand there and continuously feed it meat until it grew to be ten feet tall or something. The poor little plant only lasted for about a month before withering and dying. This is a perfect example of how very impressionable young children are by sensationalized advertising campaigns. Most carnivorous plants are actually very small. The largest one, the Nepenthes Rajah, from Borneo, can grow to be as large as 16 inches long. It is actually capable of consuming a rat or a small mammal. Yet, it is incapable of reaching out and grabbing its prey. Like the Venus Fly Trap, Nepenthes Rajah simply sits and waits for food to come to it. Continuing research lead me to a story of a man eating tree. A man named Edmund Spencer wrote an article for the New York World, which contained a letter from a man named Karl Liche that told of a native woman from the Mkodo tribe in Madagascar being sacrificed to a tree in 1874. This story was debunked in 1955 by science author Willy Ley in his book “Salamanders and Other Wonders”. It turns out the whole story, including the tree, the tribe, and Karl Liche were completely fabricated. I am rather relieved to know that when I choose to venture into an orchard or forest, trees won’t smack my hand for picking one of their apples. Hmmm…that reminds me of another great movie I can add to my watch list later. I am also a tad bit disappointed that my story concept really has no substance. It is common knowledge that humans should avoid a variety of plants which could cause them injury, discomfort, and possibly even death. Many plants and trees have sharp thorns which can scratch people if you accidentally rub up against them. There are also plants and trees which can give humans immensely itchy rashes. If ingested internally, there are even some plants which can kill people, due to the toxins which they contain. I’ve also come across an article about a non-carnivorous plant which is rather frightening looking, mostly due to its enormous size. The Corpse Plant is just so eerie. Not only does it have a rather macabre name, but it also can grow up to ten feet tall. And, perhaps the worst thing about it is the scent. It apparently smells like rotten animals decomposing. If I were to have a nightmare about any plant, the Corpse Plant would be it. A gigantic flower that smells like dung? How weird is that? However, do bear in mind that plants and trees have no malicious intentions. I mean, they are not capable of plotting to seek out and destroy humans. Or, are they? Mwah ha ha ha. 😉 Scientists are always discovering new species of life, both plant and animal. After all, as I often state repeatedly, blog after blog after blog, anything is possible. Thanks for reading, fellow bloggers. I believe it’s time for me to turn off the TV and get some sleep now. If I could only remember where I put that bottle of weed control spray… Perhaps I should cut down on the amount of cold medicine I have been taking. 🙂 Good cheer, good luck, and good health to you all! Up until this point in time, the majority of my posts have been about “monsters” of the furry variety. Animals with sharp fangs and claws that tend to give small children nightmares and keep adults awake at night have been the main topics of my studies. With Halloween right around the corner, I thought now would be a great time to analyze one of the most truly misunderstood groups of alleged monsters I have ever had the privilege of investigating, witches. For the purpose of this article, I am presenting you with a summary of an interview with, believe it or not, a real witch. I have chosen not to reveal the witch’s name in order to protect her identity. I would also like to state that this interview may present alternate religious viewpoints, and I would like to request that readers refrain from sending me derogatory or inflammatory comments after reading this article. I don’t enjoy participating in religious debates, nor do I wish to try to convert anybody to any religious affiliation by printing this article. I am merely trying to debunk the various myths and misinformation which have been associated with witches for centuries. With that being said, on to the interview now. Question #1: How long have you been a witch? Answer: I have been a sole practitioner of the craft of the wise for over 20 years now. I was raised Southern Baptist by my parents, and never felt I quite fit in with that religion. In my early 20’s, I worked with a lady who was Wiccan. I asked her several questions about the Wiccan religion, and she very politely answered them. I was just as misinformed as the majority of the population is about this religion before I met her. From there, I purchased several books about Wicca and just decided it was the right choice for me. Question #2: What is the Wiccan religion? Answer: Wicca is a positive, nature based religion that is very similar to Native American spirituality. Some religions are monotheistic, which means they worship only one God. Wicca is polytheistic, which means several members of this faith worship more than one God and/or Goddess. Most major religions all believe in the same basic, general tenet, which is to treat others as you would like to be treated. The Wiccan rede is actually: “An ye harm none, do as ye will”. This basically means do whatever you feel like doing, so long as you don’t harm anyone in the process. And, I would also like to let it be known that many Wiccans are environmentalists, conservationists, and quite a lot of us are vegan. Question #3: Do you worship Satan? Answer: The vast majority of Wiccans do not believe in the devil. We view him as sort of a creation of puritanical Christians…a boogeyman they manufactured to help enforce their ideas of morality. It would be rather counterproductive to worship someone, who in my opinion, does not exist. Question #4: Do you put curses on people? Answer: No. I firmly believe in the law of karma. If I wish for bad things to happen to people, three times that amount of bad energy would come back to me. For instance, if I wished for someone to get a wart, chances are I would get three warts. I simply avoid people who do not like me. Life is too short to spend time hanging around with negative people. Question #5: Do you perform human and/or animal sacrifices? Answer: Definitely NOT!!! Wiccans feel that all life is sacred, plant, animal, and human. This has been one of the biggest lies ever told about our religion. It is sad that even in today’s society, there are still people who believe such utter nonsense. There are no documented cases of any witch, anywhere, from the beginning of time to the present day, ever making a human or an animal sacrifice. Question #6: Do you use body parts of animals and/or humans to make potions with? Answer: No. Many Wiccans believe in the healing properties of nature. Many of them are experts on herbs. Over the course of history, herbalism was thought of as a form of sorcery or black magic. If a person were caught making any sort of potion, they could have been tried as a witch and hung. So, many moons ago, herbalists started recording the ingredients they used in their various “potions” in coded language. For instance, “eye of newt” is actually either a daylily or mustard seed, and “adder’s tongue” is actually a plant known as dogstooth violet. Trust me, no actual human or animal body parts are used in the process of making any potions. So, no need for newts to fear us, what-so-ever. We definitely don’t follow the little critters around, hoping to gauge one of their eyes out. Even the thought of it is simply barbaric. Question #7: Do you fly around on brooms? Answer: Only those of us that work at NASA and are lucky enough to have a broom with a jet pack attached to it. I am not certain where that notion came from, although I suspect it may have something to do with the fact that many Wiccans do meditate. While in deep meditation, it may be possible to achieve a sense of “flying”. We also sometimes use brooms in certain ceremonies to symbolize sweeping out negative energy. Brooms are also used in Wiccan handfasting (wedding) ceremonies. Question #8: Do all witches wear black dresses, black robes, and pointy black hats? Answer: Only on Tuesdays. LOL. The stereotypical image of witches is based on the clothes that were worn by puritanical Christians and early colonists. I guess people liked the image so much that it just stuck throughout the years. And, I should also mention that our faces are typically only green if we have eaten something which disagrees with us. Question #9: Are male witches called Warlocks? Answer: Only if you severely dislike them. The vast majority of male witches shun the term warlock because the literal translation of that word is “oath breaker”. Most often than not, if a man proclaims to be a Warlock, he has not actually studied our religion at all. Question #10: Could you cast a spell to make me a millionaire? Answer: If I had a nickel for every person who has asked me that, I would be a millionaire. There are various spells for various situations. Most spells do not come to fruition instantly. It takes a lot of preparation and a lot of time to cast a spell correctly. And, much the same as the Christian concept of prayer, sometimes spells just aren’t answered, or at least not in the way we were expecting them to be answered. Whether or not you ever become a millionaire is up to the higher power that you worship, along with the steps and measures that you take to achieve that goal. I could, however, advise you to make a budget and suggest ways for you to save money. I like helping people. I am quite human, and not in the least little bit the monster many people think me to be. So, there you have it, folks. What you just read was a real interview with a real witch. Not much of a monster, at all, is she? Thanks for reading. Blessed Samhain…err, umm, I mean Happy Halloween. I simply adore the animal that I am writing about today, for several reasons. 2. It is, aside from Australia’s Duck Billed Platypus, the most unusual looking animal I have ever seen. In my opinion, being unique is something to be celebrated. I tend to be rather partial to anything that is considered out of the norm. 3. It is a very shy, bashful, and reclusive creature. As a person who possesses the same personality traits, I can totally relate. 4. Perhaps the most profound reason for my adoration of this animal is that it gives me hope that there may just be other large animals hiding out there somewhere that scientists have yet to discover. Perhaps even my favorite cryptid of all, the infamous Sasquatch. Well…one can hope, anyway. 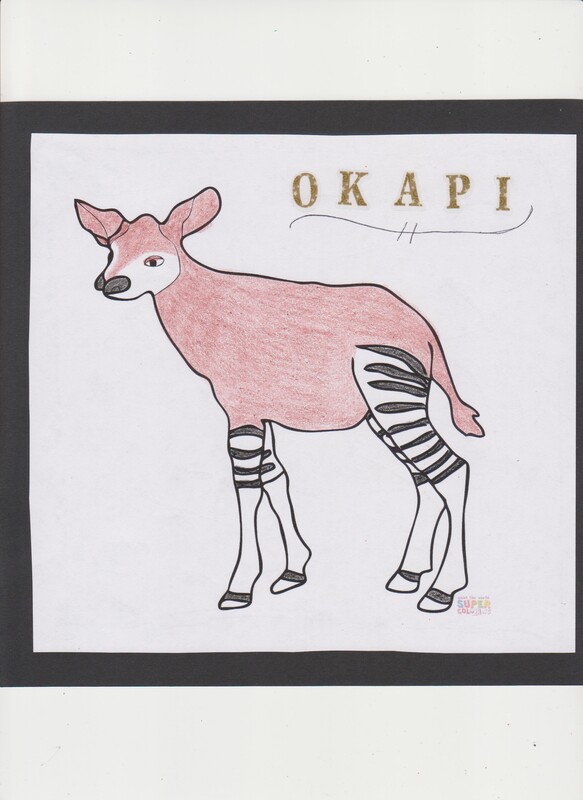 The story of the Okapi is a fascinating one, indeed. It is also a very sad story, as well. Deep in the Ituri rainforest in the Democratic Republic of the Congo in Central Africa, the native Pygmy tribes had long known of a creature that people from other parts of the world had no idea even existed, the Okapi. The Okapi is a relative of giraffes. They stand about 5 to 6 feet tall. Lengthwise, they are approximately 8 feet. They can weigh from 450 – 750 pounds. Okapis have rather long necks, large ears, a reddish brown body, white and black stripes on their legs and ankles similar to the markings on zebras, and a remarkably long tongue that is typically anywhere from 14 to 18 inches in length. The males of the species also have short, hair covered horns about 5 to 6 inches long called ossicones. The picture I posted is one I printed and colored from a website called “Super Coloring Pages”. There are several real photos and videos of Okapi on the internet, if you so choose to do a search for them, as well. Okapis are solitary herbivores. The only time they socialize with others of their kind is to breed. It takes well over a year (from 440 – 450 days) for a mother Okapi to give birth to her calf. It wasn’t until an explorer by the name of Henry Morton Stanley wrote about them in a press release in 1887 that anyone outside of the Pygmies took notice of these animals. In 1901, remains of a deceased Okapi were sent to London by adventurer Harry Johnston. The remains were studied and described by British zoologist Ray Lancaster. I find it absolutely enchanting to know that such large animals exist and were only recently discovered. It makes one wonder what other such animals there may also be in this world that nobody knows about. Okapis have excellent hearing and run away from humans when they hear them approaching. This makes Okapis very difficult to observe in the wild. The fact that the Okapi also live at altitudes of 1600 – 4900 feet in canopy forests adds to the difficulty of trying to study them. From what has been observed of the creatures, scientists believe that Okapis are an endangered species. Logging and human settlement have caused a drastic reduction in the Okapis natural habitat. They are also hunted for their meat and their skin by poachers. In 1987, the Okapi Conservation Project was started. Their website is: http://www.okapiconservation.org. Okapis are now protected by law. However, poachers still pose a major threat to their population. It is estimated that the Okapi population has been cut in half since 1995. In June of 2012, a horrible gang of poachers, known as the “Mai Mai Rebels”, attached the Okapi Wildlife Reserve and killed 6 human guards and 13 Okapis. The putrid poachers claimed they did so to retaliate against increased enforcement against wildlife poaching and illegal mining. The lecherous leader of this band of human monsters, Paul Sadala, as well of 42 of his lackey militia members, surrendered to authorities on April 12, 2014. Sadala was killed 2 days later. I can’t stand people who capture and kill animals for profit. There are a bazillion other ways to make money, for crying out loud. What I really don’t understand is how there is a market for endangered dead animal products. Why would anyone want to buy a purse, belt, rug, or boots made from animal skin? It’s not like an Okapi can be sheared like a sheep. They do not just walk around naked in the forest, waiting for new fur to grow back. These precious, totally harmless creatures are actually killed just so some heartless, soulless human monster can sell their skin and body parts. This also happens with many other endangered animals, as well. Such as, elephants, rhinos, and tigers to name a few. Once a species is extinct, there is no bringing it back. If poachers had no people to sell their macabre goods to, there would be no more sadistic slaughter of innocent, rare, elusive, and exotic animals. It is just as simple as that. If Sasquatch do exist, I really hope that scientists never do confirm their existence. I’ll bet the Okapis wish they had never been officially discovered. The problem with confirming the existence of an animal that is rumored to exist is that it creates a demand for unscrupulous people who will pay ridiculous amounts of money to own parts and/or pieces of that animal for no other reason than to brag about possessing such a rare specimen. Vanity, pure vanity. The government of Africa is doing a great job of conserving their endangered species now. There are also many zoos that have Okapis in captive breeding programs. I do have great hopes for the survival of this species. With an estimated less than 25,000 of them left in the wild, perhaps I am being overly optimistic. I hope not. Thanks for reading. Please think twice about buying products made from animal skin, bones, or tusks. Keep in mind that an animal actually had to DIE for that product to be made, and it may very well have been the very last one of its kind. I’d much rather buy an Okapi stuffed animal toy from a zoo or make a donation to the Okapi Conservation Project to help fund their conservation efforts. I really hope these gentle giants will survive and bring joy to many future generations to come.